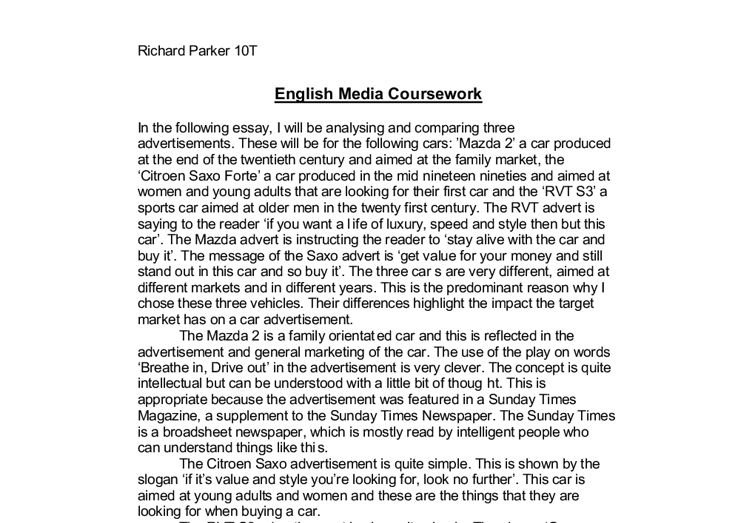 English Media Coursework In the following essay, I will be analysing and comparing three advertisements. These will be for the following cars: 'Mazda 2' a car produced at the end of the twentieth century and aimed at the family market, the 'Citroen Saxo Forte' a car produced in the mid nineteen nineties and aimed at women and young adults that are looking for their first car and the 'RVT S3' a sports car aimed at older men in the twenty first century. The RVT advert is saying to the reader 'if you want a life of luxury, speed and style then but this car'. The Mazda advert is instructing the reader to 'stay alive with the car and buy it'. The message of the Saxo advert is 'get value for your money and still stand out in this car and so buy it'. The three cars are very different, aimed at different markets and in different years. This is the predominant reason why I chose these three vehicles. Their differences highlight the impact the target market has on a car advertisement. The Mazda 2 is a family orientated car and this is reflected in the advertisement and general marketing of the car. ...read more. This adds to the persuasiveness of the advert and immediately makes the reader read the rest of the text because they want to know why driving this car will be therapeutic. Throughout the advertisement, many adjectives are used such as 'tough', 'new', 'nimble' and 'great'. 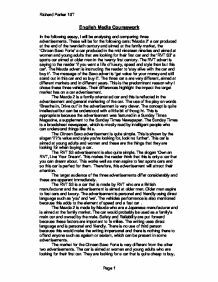 These are a persuasive technique used in many adverts to make the text powerful and attractive to read. The text in the RVT is quite similar to the Mazda advertisement. It starts off with a rhetorical question 'Who say's you can't drive fast and safe.' This is a very powerful persuasive technique and makes the reader read on because they want to know why you can drive fast and safe in this car. The second sentence has the adjective 'new' in it, which suggests to the reader that this car is modern and better. The fourth sentence is a three-part list, which builds impact and adds to the persuasiveness of the advert. The language used in the Citroen Saxo advertisement is very persuasive and links well to the target audience. There is no technical jargon about the engine specification because women do not want to know this, all they're bothered about is the look and image and what the car can do for them. ...read more. There is some writing in bold, which makes you read that first and there is quite a lot of writing below it. The picture of the car is big, which is the only thing that makes it stand out, as the picture of the car and the background are the same colour. I personally like the Mazda 2 advert the best but I believe that all of the advertisements serve their purpose. They all attract different target audiences and make the reader remember what they are advertising. I think that the Mazda advert is the best because even though the layout is quite simple, it is very eye-catching and effective. Next, I think is the RVT advert as it has persuasive writing and you can remember the name of the car at the end and so it is still quite effective. Finally, I think that the Citroen Saxo advertisement has persuasive text but there is no heading or slogan to remember the car by. It is all one colour, is not very eye-catching and there is too much writing. Therefore, I do not think that this advert is as effective as the other two. Advertisements are a persuasive device, which aim to make people stop and read them but then remember them as well. Depending on their purpose and who is reading them, all advertisements are effective. Richard Parker 10T Page 1 ...read more. In the third Audi advertisement your attention was focused on the frog, which is personified so the car parts are made into the frog. The frog projects the feeling of stability, and the ability to stick to the road in any condition presented. This is a desired effect to give each advert a sense of individuality. When all of the different devices are used it creates innovative adverts, which suggests an innovative car. Included in bolder print is the telephone number and website of the company. This is to illustrate that public relations is important to them. All of this is intended to make the reader feel that the company is their friend and they can trust them. although this is not a huge cost as supermarkets, for example, already has the shelf space needed for simple distribution. The newspaper is locally, regionally or nationally directly supplied to retail outlets for distribution to the customers, although not directly in terms of door-to-door or mail ordering. The bottle is fairly life sized and is blue and white. The photo is taken close up. ADVERTISEMENT NUMBER 3 This is a photograph of an attractive woman, in her mid twenties, lying across a light grey sofa which takes up the whole background of the photograph. It is the main feature with most of the attention drawn to it, whereas the Fiat Seicento 2Tone is placed at the top of the page, with a wider spread surrounding. The setting of each advertisement has a similar connection to the type of car and the audience they are persuading.